Join us for a free, public concert featuring Howard University's premier vocal jazz ensemble, Afro Blue! 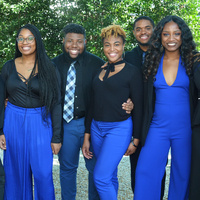 Afro Blue is Howard University's premier vocal jazz ensemble. Founded in 2002 by jazz voice coordinator Connaitre Miller, this dynamic jazz choir quickly gained national attention. Afro Blue has been featured on NPR's All Things Considered, reached the top four on NBC-TV's The Sing-Off and joined the legendary Bobby McFerrin in selections from his Grammy-nominated VOCAbuLarieS album. My mother loves jazz music, I will probably give her a ticket for such a performance. As a sign of gratitude, because on my birthday she gave a ticket for the best show https://best-vegas.com/best-shows/absinthe-tickets-online/ this will be my first show, which I will manage to visit with friends.